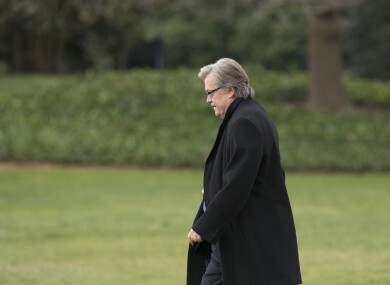 PRESIDENT DONALD TRUMP has removed chief strategist Steve Bannon from the National Security Council, reversing an earlier, controversial decision to give Bannon access to the high-level meetings. A new memorandum about the council’s composition was published today in the Federal Register. The memo no longer lists the chief strategist as a member of the Principals Committee, a group of high-ranking officials who meet to discuss pressing national security priorities. A senior White House official said today that Bannon was initially placed on the National Security Council after Trump’s inauguration as a measure to ensure implementation of the president’s vision, including efforts to downsize and streamline operations at the NSC. Trump’s first national security adviser, Michael Flynn, was at the helm of the NSC at the time, but the official says Bannon’s role on the committee had nothing to do with the troubles facing Flynn, who was later asked to resign for misleading the administration about his communication with Russian officials. The senior White House official was not authorised to discuss changes that have not been formally announced and spoke on condition of anonymity. Bannon’s addition to the NSC sparked concerns from Trump critics, who said it was inappropriate for the political adviser to play a role in national security matters. Bernie Sanders called it “dangerous and unprecedented”. “Even George Bush wouldn’t let his chief advisor Karl Rove near the National Security Council, as it’s seen as being meant for senior experienced politicians,” David Fitzgerald, politics lecturer at UCC told TheJournal.ie. Bannon has been repeatedly credited with Donald Trump’s election win – swooping in to take over his campaign at a time when the television personality hadn’t gained much momentum. Bannon is a former US Navy officer and Harvard MBA who previously worked at Goldman Sachs. He was also editor of Brietbart News, which had a racist-charged history before Bannon took charge – choosing and framing stories around white-racial panic. Critics see more self-interest than devotion to conservatism in Bannon’s actions. “He’s really good at ingratiating himself to prominent people,” Ben Shapiro said, a former Breitbart editor who’s now a Bannon critic. With reporting from Gráinne Ní Aodha. Read: What real power does Steven Bannon have in a Trump administration? Email “Donald Trump takes his advisor Steve Bannon off National Security Council”. Feedback on “Donald Trump takes his advisor Steve Bannon off National Security Council”.